I've read two contrasting books this week. Holy Week, the week leading up to Easter. 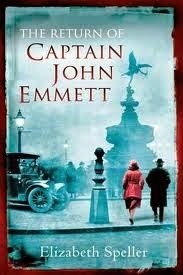 The Return of Captain John Emmett is a brilliant novel of the immediate aftermath of the Great War. It concerns the quest of Emmett's sister Mary, to discover the reasons behind his inexplicable suicide just some two years aftert the close the war. To do that she enlists the help of old friend Laurence Bartram who had come through the war himself, and who's wife Louise had died during childbirth whilst Bartam was serng at the front. The book is a beautiful and haunting unravelling of the varied experiences of those caught up in the tragedy of war. From invalided soldiers and grieving mothers, to those still affected after taking part in the summary execution of an officer, 'for the sake of example', some three or four years earlier. At the heart of the book is an exploration of Captain Emmett's life and character, his love of poetry and his sense of humanity and justice. Mary doesn't just want to know how he died but why. What was the reason for his death? In the Cross and the Colliery are eight short meditations on the Easter theme for Holy Week, by the then Bishop of Durham, Tom Wright, as they were given in Easingtom parish church in County Durham. Easingtom was chosen because the community had gone through its own Calvary in1951 when 83 miners wee killed in an underground explosion. 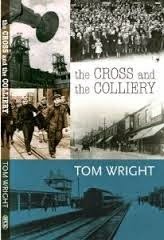 And then in 1993 when the colliery was closed and the heart was ripped out of the community. As Wright points out the whole focus of the Bible story is the Easter event. He uses the analogy of the canoeist heading for a waterfall. To get the correct channel the canoeist must aim for the inverted V in the rushing water that can be seen on approach. Pass over at another point and the canoe goes sideways and the canoeist has a hard fall, but get the channel right and the journey continues. And so the cross and resurrection of Christ are the apex and centre of the history of the world. Respond correctly to that and our life will have meaning and purpose which sustains though life and on into eternity. What mattered about Captain Emmett was not his poetry, war service, or means of death-seemingy shot by suicide-but the reason behind it. It's only a surprise that so much of the gospel accounts are taken up with the death of Jesus, and so much of the rest of the New Testament with the reason for his death, if we fail to see that this death gets to the core of all reality. From good to great Easter song? "The DNA of sin is deception"